Shaye Wolf studies seabird breeding colonies off the coasts of California and Mexico. Photo by Brown Cannon III. This Xantus's murrelet chick was attracted to a light bulb and failed to follow its parents out to sea. Photo by Shaye Wolf. As part of her research for a master's degree in ocean sciences at the University of California, Santa Cruz, graduate student Shaye Wolf documented the large and diverse populations of seabirds that nest on the Coronado Islands, a group of small islands off the coast of Baja California, just south of the Mexican border. Now, Wolf's findings have helped save those seabirds from the potentially devastating effects of a liquified natural gas facility that Chevron was planning to build next to the islands. Wolf, now working on a Ph.D. in ecology and evolutionary biology, began studying seabirds in Baja California in 2000. Her master's thesis involved assessing the status of seabird populations along the Pacific coast of the United States and Mexico--conducting surveys of breeding populations, compiling data from previous studies, and reviewing the conservation status of seabird species. "My findings highlighted the importance of those islands along the Mexican coast," Wolf said. "They have not been studied much, but they have huge numbers of seabirds and enormous diversity." While she was doing research there, she learned of Chevron's plans to build a liquified natural gas (LNG) terminal less than 700 yards from the south island of the Coronado Islands. The island has breeding colonies of six threatened or endangered bird species, including the largest known colony of the rare Xantus's murrelet, a small seabird listed as endangered under Mexican law and threatened in California. The murrelets and four other species that nest on the island are nocturnal, and Wolf was especially concerned about the effects of the terminal's lights. "These nocturnal seabirds are very sensitive to artificial light," she said. "I knew from my research that even a single light bulb would attract birds--they circle lights like moths, they fly into lighted structures, and lights make them more vulnerable to predators. The tremendous amount of lighting from the terminals and tankers would be devastating." In addition, Wolf said, the LNG terminal would take up 100 million gallons of seawater daily, killing larvae and other small organisms in the water and disrupting a highly productive marine ecosystem that supports not only the seabirds but also fish and other marine life around the islands. "It doesn't make sense to put a big industrial facility the size of a football field right next to a biodiversity hot spot," Wolf said. Mexican environmental groups were also opposed to the terminal and had challenged the environmental assessment and the validity of the permits issued to Chevron by the Mexican government. But their efforts were not successful, and by 2005 the groups had exhausted their legal options in the Mexican courts. At that point, another UCSC graduate student entered the picture--Wolf's husband Doug Bevington, a doctoral candidate in sociology studying environmental advocacy groups. Bevington knew of a lawyer who had mounted a cross-border challenge in another environmental case through a commission set up under a side agreement of the North American Free Trade Agreement (NAFTA). The NAFTA Commission for Environmental Cooperation was established to keep companies from evading environmental regulations in one country by moving operations to a country with fewer restrictions. Bevington contacted the lawyer--Jay Tutchton, director of the Environmental Law Clinical Partnership at the University of Denver--who agreed to help file a petition with the NAFTA Commission. Wolf wrote the science portion of the petition, and Tutchton, working pro bono, wrote the legal portion. Bevington pulled together a coalition of environmental groups that joined in the petition, including the Center for Biological Diversity, Greenpeace Mexico, American Bird Conservancy, Los Angeles Audubon, Pacific Environment, and WildCoast. They submitted the petition in May 2005, and the commission agreed to look into the case. In January of this year, the commission recommended an investigation into whether Mexico had violated its own environmental laws in approving Chevron's proposal. That led to Chevron's announcement in March that it was abandoning its plans to build the LNG facility at the Coronado Islands site. "This was a major environmental victory, and Shaye Wolf's seabird data were critical to the argument that the islands should be protected," said Bernie Tershy, assistant adjunct professor of ecology and evolutionary biology at UCSC and one of Wolf's academic advisers. Wolf, however, insists that she was just one person in a large group of people and organizations that contributed to the effort. "A lot of people worked to stop the terminal from different angles, and that joint effort was really successful," she said. "Doug [Bevington] identified the legal tool that enabled us to challenge the environmental violations of a big multinational company and the Mexican government. As a result, we were able to help the birds." Another key petitioner was Alfonso Aguirre, who directs Conservación de Islas in Mexico, an offshoot of the Island Conservation and Ecology Group (ICEG) based at UCSC's Center for Ocean Health. Tershy and Wolf's other adviser, associate professor of ecology and evolutionary biology Donald Croll, founded ICEG as a nonprofit devoted to protecting and restoring island ecosystems. Wolf's research on seabird populations supports the group's efforts. For her master's thesis, she compared the islands of Baja California with the islands off the coast of California in terms of seabird populations and investments in conservation. "I found that there are ten times more seabirds on the Mexican islands, yet the investment in conservation programs to protect them is just a fraction of that in California," she said. Those findings laid the foundation for a proposal to create a protected natural area for the Baja California Pacific islands, including the Coronado Islands. Mexican lawmakers have passed a resolution endorsing such a reserve, although the official designation has not yet been authorized, Wolf said. 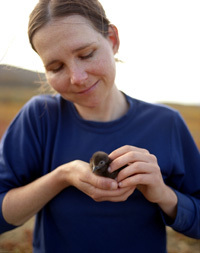 For her Ph.D., Wolf is studying the Cassin's auklet, a widely distributed seabird found along the Pacific coast from Baja California to Alaska. She is looking at the influence of oceanographic variability on survival and reproductive success of Cassin's auklets and comparing populations in Canada, the United States, and Mexico. Cassin's auklet is one of several species of seabirds affected by unusual ocean conditions in 2005 that led to large numbers of dead birds washing ashore in California. As part of her research, Wolf is working with scientists in UCSC's Climate Change and Impacts Laboratory, led by professor of Earth and planetary sciences Lisa Sloan, and using a regional climate model of the California Current system to see how predicted oceanographic effects of climate change might affect seabirds. "I want to establish how seabirds, and in particular Cassin's auklets, are affected by the current variability in ocean conditions, and how predicted changes in the ocean from climate change will affect seabird populations in the future," Wolf said. Wolf's research is supported in part by a grant from UCSC's STEPS Institute for Innovation in Environmental Research. Note to reporters: You may contact Wolf at (831) 459-4581 or wolf@biology.ucsc.edu.